Our silver chains are all made In Italy using modern techniques and machinery. Over the years, we have built up a large collection of beautiful and popular styles, the types of which are featured below. There's something here for everyone whether it is a plain sterling silver chain, a classic silver rope chain or a silver link chain to complement that little black dress. We offer a comprehensive range of widths (from 1.1mm to 15mm) and lengths starting with a short chain at 14" to a long 40" chain - a belly skimmer! Ladies, it's time to dress up with our selection of silver byzantine chains, silver box chains and silver popcorn chains. Italian sterling silver link chains and necklaces including trace chains & statement chain necklaces. Italian sterling silver popcorn chains. Italian sterling silver solid rope chains in widths 2.3mm, 4mm, 6mm and 7mm. 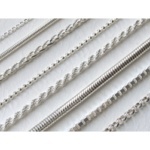 Italian sterling silver snake chains in widths 1.1mm, 2mm, 3mm and 5mm.